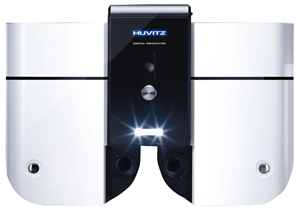 The Huvitz HDR-7000 Digital Refractor features a slim design with wide viewing angle makes possible to approach more precision. Features fast and silent lens loading with dual cross cylinder lens, automatic occlusion and automatic convergence. The Huvitz HDR-7000 allows you to fulfill more precise exam with various vision tests including 18 visual acuity test charts, 26 vision test charts, and up to 35 user defined unit test charts to support the most advanced eye test process. User-friendly touch screen interface, jog dial and tact switches provide perfect control on various operations and the detachable design of the frequently contaminated parts (Forehead Rests, Face Shields, and Lens Windows) helps easier and faster cleanup. My Phoropter is the BEST!